Once again, I was at a certain place in Central Tokyo until late last night, filming for the drama series, “IQ246.” There are only two episodes left to film, and the drama is heading toward its climax. Until episode 6, I had played the part of Tomomi, a medical coroner, who loves dead bodies and Sharaku Homonji more than anyone else, but it is revealed that this was all a deception. Tomomi actually turns out to be Maria T, an intellectual criminal, who manipulates people with a desire to murder, with an IQ superior even to that of Homonji, played by Yuji Oda. Maria T’s costume, entirely in black, was designed by Alexander McQueen, and I made sure that I wore it in a way that allowed viewers to recognize her just from her silhouette. It had been a while since I had worn fishnet stockings. The seams at the back were always slipping out of line, and it was rather annoying having to straighten them out every time before the cameras started rolling. Maria T gives out her orders from a room filled with light and shadows, and the teacup she uses whenever she drinks tea was made by Kenta Anzai, who has a kiln in Koriyama of Fukushima. 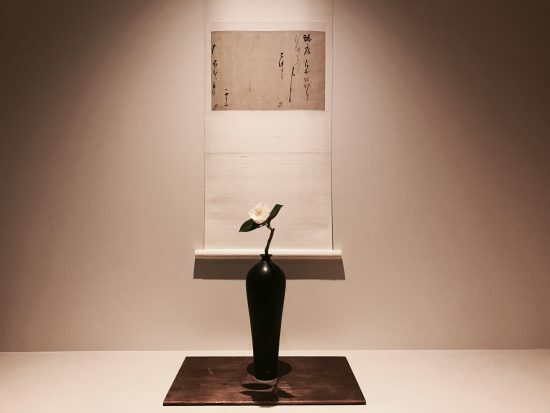 He was an apprentice of Taizo Kuroda, and is a master of the art of making “totai shikki” in which baked earthenware is coated with lacquer and repeatedly polished to suppress its glossiness for an elegant, matte finish. Normally it takes two to three months for the lacquer to dry after coating the baked earthenware with it, but upon my desperate begging he made it in just under a month prior to the start of filming. I believe that the choice of a single cup can reveal so much about a person’s way of life, and every time I play a new character, I place as much importance on what kind of earthenware I use as I do on my choice of clothes and props used for my room. Incidentally, the perverted Tomomi put “dashi” soup stock in beakers. The 7th episode of TBS’ Sunday Theater drama series, “IQ246,” will be broadcast tonight starting at 9:00 P.M. Don’t miss it.